To call it a palace is to give far too grand an impression. Not even a respectable castle, the structure within the Imperial Woods comprises just three modestly sized buildings. Fronting them is Stormbringer's home and the place where he receives guests. No more than a reasonably sized manor house built of the rough stone so prevalent in Nanthalion, it presents an obvious symbol of the newness of his empire. And perhaps it's potential instability too; the heavy wooden doors are studded and banded with iron, while such windows as there are on the ground floor comprise no more than arrow slits. Above that level the building looks rather more hospitable though, with larger shuttered windows on the two remaining storeys of his home and even some minor embellishments such as carvings. Above all, on the low-pitched, crenelated roof, his standard floats to add a touch of color. Inside, it is plain that the lower floor is utilitarian. Storage chambers look to hold enough food and equipment to withstand a moderate siege, in conjuction with the internal well. There one can also find a large kitchen, quarters for the servants, and rooms that appear to have no obvious purpose. Thinking about preparation for a siege though, it seems likely they could house extra troops or even horses if needed. A wide stone staircase leads up the center of this area, from the large outer door to a balustraded gallery from which several rooms lead off. A more modest staircase rises upwards again towards the guest sleeping accomodations and Stormbringer's private rooms - his study and lounge, the large bedroom he shares with his consorts, a bathroom and perhaps other rooms beyond the obvious. Few have been invited to satisfy their curiosity on that question. Even within this part of the house there is an air of functionality. Invaders would have to make their way up that open first staircase while under attack from archers hiding behind the balustrades. Not that it is austere though. Above the lowest level carpets cover much of the stone floors, tapestries hide bare walls and plentiful candles add to the light coming through the large windows. The middle level is reserved for the reception of guests. A large banqueting hall faces the stairs, flanked by other rooms, both formal and informal. According to need, the emperor and his mate can entertain in casual, comfortable surroundings or surrounded by the trappings of his power. 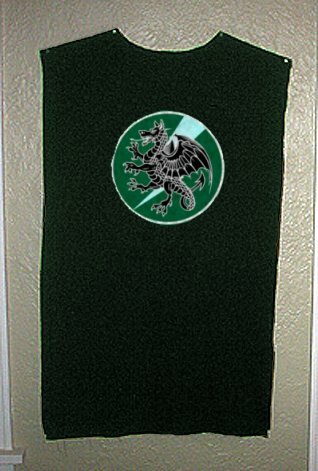 This is the banner of Stormbringer and hence, of the empire itself. 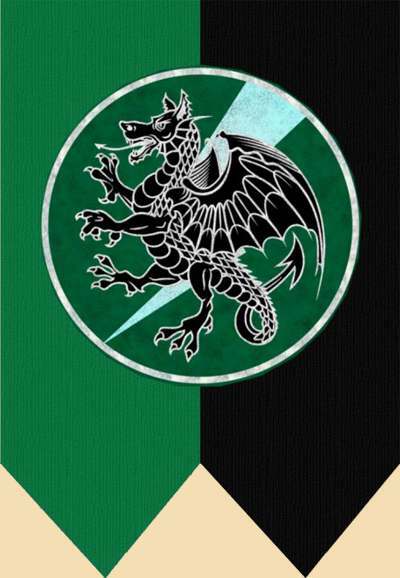 A version of it is worn on the cloaks of the Imperial Guard and it reflects the official colors of dark green and black, together with the imperial dragon. Designed by Taomiel. Imperial Guards are rarely seen within the house itself but they can regularly be seen patrolling the surrounding woods. A modest keep behind the main residence affords a place for them to relax or sleep when off duty. Provided with it's own kitchen and servants, together with facilities for Inn slaves to be brought across to supply entertainment, it accomodates all of their needs. On the floor above, those Imperial Guards who do not have their own home are allotted comfortable rooms. Beside the Guards Keep is the inevitable stable where horses are kept and behind them all, vegetable gardens and the cottage of the huntsman help to ensure that food is always plentiful for the kitchens. Within the building itself there is a small corps of palace guards led by a captain. They are responsible for internal security and can be identified by the uniforms, which differ from those of the Imperials. The tabard for the female slave is quite lovely indeed. With the see through material, the black lace ties.. and even the pretty patch over the heart of the dragon, any female would be lucky to wear one. The silver threading is enchanted with tongues, a spell that is permanent. 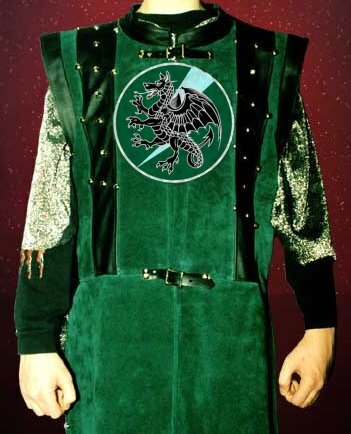 When you put the tabard on, it is automatically activated. The male uniform is a bit more conservative, with a simple dark green material and black ties. The dragon on the center of the uniform is larger, but the silver threading has the same tongues spell as the female’s uniform does. This spell is permanent, as in when you put the tabard on, it is automatically activated.